Rumor says ucbart will attend. Hope he can find a seat. I will be in attendance. HAAAAA. I'm sure I'll be able to find a seat for a 3:00, election day, Tuesday game....in the 36,000 seat Carrier Dome. I'm going to get a seat right on the floor under the basket I think. 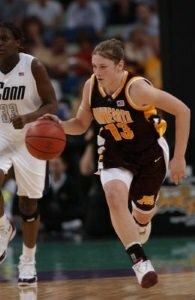 I’m looking forward to Lexi Klabo torching Syracuse before Tania takes over the game. I can dream right? Hoping for a Sioux upset (I can dream, right?)! Lexi Klabo is the real deal. Go und! I can see the Rebkell Daily headline now. "Sentimental Favorites Sioux triumph over Orange"
Lexie Klabo 5 - Syracuse 5. We've got a decent game so far folks! North Dakota all knotted up with Syracuse at the end of 1! *Syracuse uses WAAAAAAAY too many players. There is no flow to their offense. *Tianna, while good, forces too much and their offense has no discipline because of her. *UND is well coached but they started to have a real problem with the athleticism of the Syracuse zone. Syracuse up 41-30 at the half. *UND hit some timely 3’s to keep it relatively close but the zone and especially the press is killing them. *The score should be much higher but Syracuse has missed a bunch of 3’s and they’re just too undisciplined on offense. *Q has eased Emily Engstler into action, but it’s very clear she’s Syracuse’s best player. The girl just oozes game. She looks a bit lost defensively and very nervous, but when it clicks, she’s gonna be good. Very good. *Syracuse will get better and they have to. They would be losing to a quality opponent with their play. *Syracuse really turned up the D. Hard. *Q shortened up his rotation. *Engatler showed by she was a McD’a AA but she really needs to work on her conditioning. She is winded. For as bad as Syracuse played in the 1Q and parts of the second, they totally made up for it in the second half. Yes, North Dakota was outmatched and they had nobody athletic enough to hang with Syracuse, but they were disciplined.....until Syracuse started that press. Syracuse does a great job defensively. They are quick all over the court and their bigs can run the floor. When Q tightened up the rotation in the second half, things really started to come together. This just in-Emily Engstler will be an All-American by the time she graduates. When she gets in better shape and learns how to play at this level, especially on defense...she will be great. Her game is effortless and she missed about 3 layups that she will probably never miss again. I think I'm going to buy season tickets. She sounds like a player! Thanks for the comments from the Dome.